For as long as I have been aware of Disneyland, I have been fascinated about the history of Walt Disney's Happiest Place On Earth. I've read books, magazines, and blogs about the park as it once was. 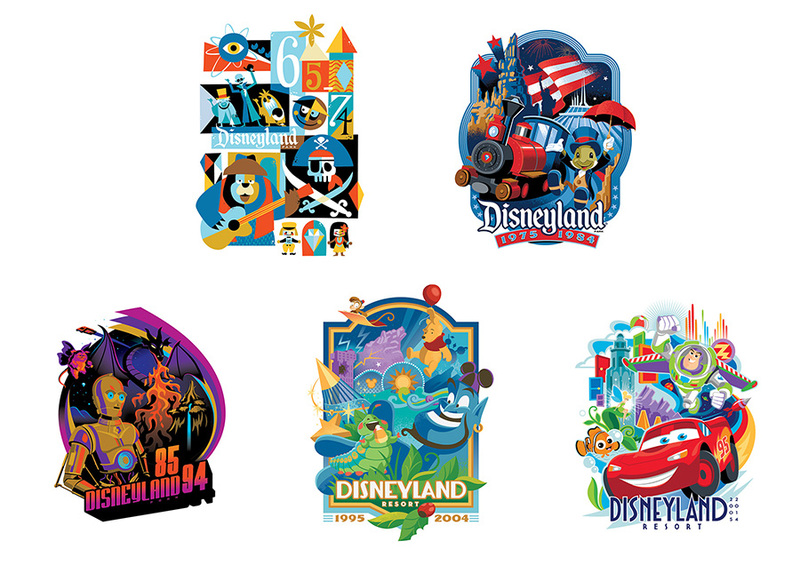 With the arrival of Disneyland's sixtieth anniversary, it seems as though someone at Disneyland schemes to take advantage of my nostalgia. The Disney Blog posted these images showing some of the merchandise based on the first decade art and as well as the designs for the other five decades by artist Jeff Granito. I'm impressed with the details and styles chosen for each decade. Each feels true to the time period depicted. 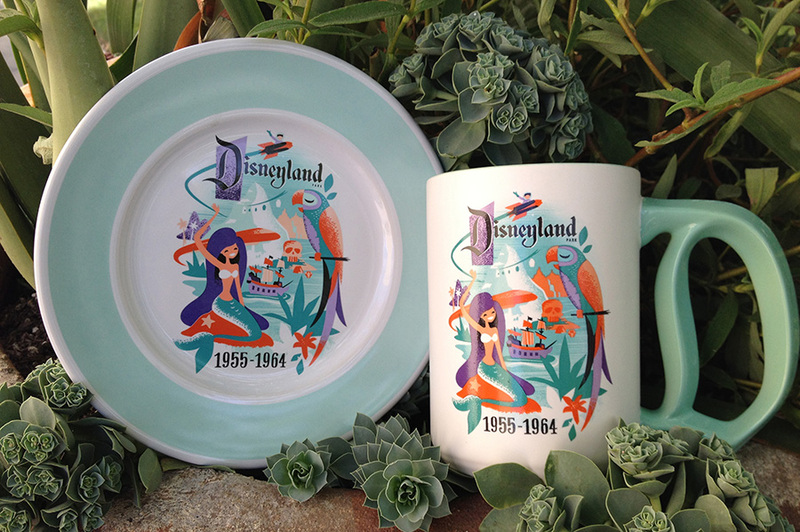 No, I'm never going to buy a commemorative plate or mug. Or a shirt or pin for that matter. But, a nice print would look really good above my desk. Disneyland is going to take all of my money. In an interview with Polygon, lead designer Ion Hazzikostas revealed that Blizzard will no longer allow flying in future expansions. When Warlords of Draenor first hit, some fans were surprised to discover that even upon reaching the new level cap of 100, they couldn't fly with their air-based mounts in the new zones. Initially Blizzard expected to patch in flying at some point, but now it has changed its mind. "Having looked at how flying has played out in the old world in the last couple of expansions, we realized that while we were doing it out of this ingrained habit after we introduced flying in The Burning Crusade, it actually detracted from gameplay in a whole lot of ways," Hazzikostas explains. "While there was certainly convenience in being able to completely explore the world in three dimensions, that also came at the expense of gameplay like targeted exploration, like trying to figure out what's in that cave on top of a hill and how do I get up there." Hazzikostas gives an example: Before flying was introduced to World of Warcraft, if you got a quest to rescue a prisoner from an enemy encampment, it would play out a certain way. Players would need to fight their way through the camp. After flying, players could just fly into the center of camp, land on top of the hut where the prisoner is, free him and fly out. "It made the world feel in many ways much smaller," he says. Originally, Blizzard took out flying in Warlords of Draenor as an experiment, and Hazzikostas says he would have bet "slightly better than even money at the time" that they were going to bring it back eventually. But as they played the expansion and watched others play it, they discovered that they liked the game better without flying. "The world feels larger, feels more dangerous," he says. "There's more room for exploration, for secrets, for discovery and overall immersion in the world. At this point, we feel that outdoor gameplay in World of Warcraft is ultimately better without flying. We're not going to be reintroducing the ability to fly in Draenor, and that's kind of where we're at going forward." Hazziokostas confirms that this direction includes future expansions, though he doesn't discount the possibility of adding flight options in to specific expansion ideas or zones that would benefit from it. In general, though, he believes that exploration in Blizzard's massive world "works better and feels better in our view when you're doing it from the ground." He also promises that Blizzard will continue working to improve its network of taxi flight paths in the game to prevent any major frustration from this change: "The goal is to maximize convenience in getting from point a to point but retaining as much of the gameplay and depth as possible once you do get to that point." Flying has always been better in theory than in practice. Blizzard realized very fast that flying mount broke their game, but have waited (what is it now?) eight years to reverse their decision. I appreciate that Blizzard knows how to rip out systems that aren't working. But doing so after you've sold flying mounts in their cash shop makes this a little strange. © 2015 Marty Runyon. All rights reserved.